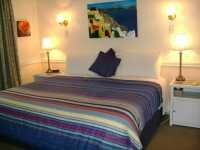 Attractive Queen ensuite room,ocean glimpse, plush comfortable bed, R/c a/c, tea/coffee, fridge, HD TV & DVD (dvds complimentary),ipod dock, Adjacent to balcony overlooking garden. 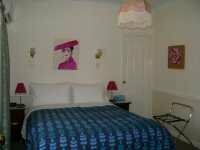 Plump, plush queen bed with large bathroom en-suite, bath, shower and separate W.C. Window overlooks garden. R/C Air cond. tea/coffee, fridge, hairdryer, internet, HDTV, DVD, ipod dock, Original art. Offers plump, plush queen bed with additional single sofa bed, bay window, ensuite & work station and is adjacent to the large balcony, also has air conditioning, tea/coffee, fridge, hairdryer, internet, ipod dock, high definition TV/dvd player and original artworks.